Potassium Word Origin: English potash pot ashes; Latin kalium, Arabic qali: alkali. Isotopes: There are 17 isotopes of potassium. Natural potassium is composed of three isotopes, including potassium-40 (0.0118%), a radioactive isotope with a half life of 1.28 x 109 years. Potassium Properties: Potassium's melting point is 63.25°C, boiling point is 760°C, specific gravity is 0.862 (20°C), with a valence of 1. Potassium is one of the most reactive and electropositive of metals. The only metal that is lighter than potassium is lithium. The silvery white metal is soft (easily cut with a knife). The metal must be stored in a mineral oil, such as kerosene, as it oxidizes rapidly in air and catches fire spontaneously when exposed to water. Its decomposition in water evolves hydrogen. Potassium and its salts will color flames violet. Uses: Potash is in high demand as a fertilizer. Potassium, found in most soils, is an element that is essential for plant growth. An alloy of potassium and sodium is used as a heat transfer medium. Potassium salts have many commercial uses. 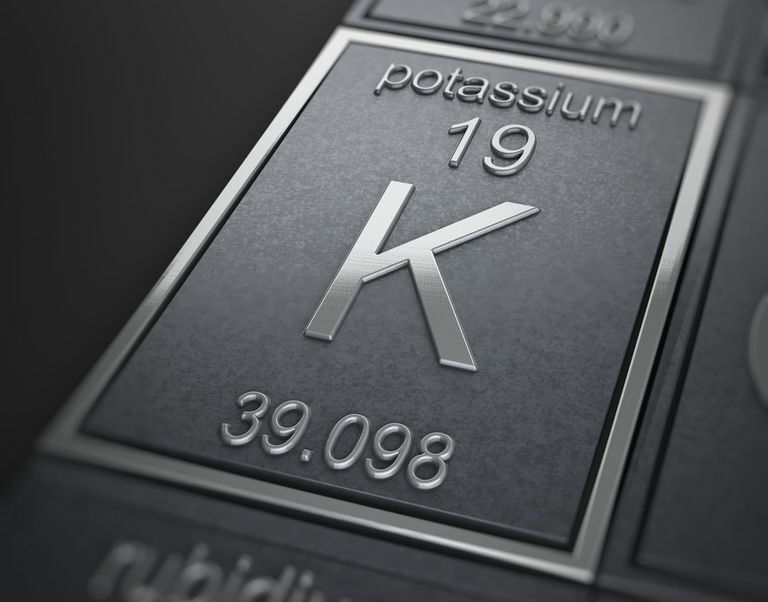 Sources: Potassium is the 7th most abundant element on earth, making up 2.4% of the earth's crust, by weight. Potassium is not found free in nature. Potassium was the first metal isolated by electrolysis (Davy, 1807, from caustic potash KOH). Thermal methods (reduction of potassium compounds with C, Si, Na, CaC2) are also used to produce potassium. Sylvite, langbeinite, carnallite, and polyhalite form extensive deposits in ancient lake and sea beds, from which potassium salts can be obtained. In addition to other locations, potash is mined in Germany, Utah, California, and New Mexico.